• Touch-sensitive knobs access TRAKTOR PRO 2 browse and loop views instantly Future of DJing: MK in Glasgow Felix da Housecat on TRAKTOR KONTROL X1 RESPONSIVE DJ PERFORMANCE TRAKTOR KONTROL X1 is the compact DJ performance controller with responsive controls over two TRAKTOR PRO 2 decks and FX units. COMPACT TRAKTOR CONTROL Whether DJing all-digital or with timecode control, the mighty TRAKTOR KONTROL X1 gives you total control of decks and effects in TRAKTOR PRO 2, with a unique combination of power and portability. BUILT FOR PROS The X1 packs TRAKTOR PRO 2's decks and effects features into a portable, intuitive unit. Browse, cue, sync, and loop while the touch-sensitive strip and knobs deliver smart software navigation. Plus color-coded buttons and displays give clear visual feedback - so you can stay focused even in the darkest clubs. SIMPLE. POWERFUL. SMART. TOUCH STRIP Get physical with your music. The X1's multi-purpose touch strip delivers ultra-precise command over track position, pitch bend, and FX. From nudging or needle dropping, to track seeking or loop length, the LED-guided touch strip's settings instantly adapt to match your needs - your fingers do the rest. Or assign it to control effect parameters, for some expressive firepower. REACTIVE ENCODERS TRAKTOR KONTROL X1's touch-sensitive encoders even respond to reveal TRAKTOR PRO 2 views and functions. Instantly switch to the Browse view at the touch of the Browse button. Touching the Loop encoder while holding Shift+Play lets you see your track's key, while holding Sync reveals the tempo. It's all taken care of behind the scenes. DESIGNED FOR TRAKTOR PRO 2 Take your set to new heights with the flagship TRAKTOR PRO 2 software. Mix with up to four decks plus a stunning range of creative features for maximum mixing freedom. Perfect for added TRAKTOR SCRATCH DVS control. The ultimate TRAKTOR PRO setup: X1 on decks and effects. The Z2 takes care of the rest. 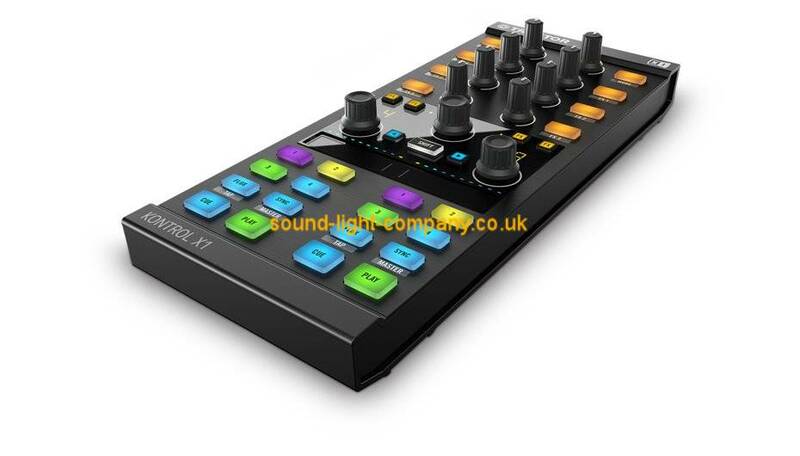 THE PRESS ON TRAKTOR KONTROL X1 "The Traktor Kontrol X1 MK2 is a fantastic controller that manages to keep the slickness of the original controller while adding killer new features." DJ Mag "The Traktor Kontrol X1 MK2 is impressive." Resident Advisor "The Traktor Kontrol X1 MK2 controller is a real no-brainer update to the original X1."